“You’ll want more!” You’ll want more!” That is what people are saying about Charleston’s own powerful rock quartet, “Soul Fish”. This four-piece rock band not only keeps you dancing and singing all night long, but consistently strives to create that perfect moment that you want for your special day. “Soul Fish” is a well-seasoned wedding and event party band who is well known for their “all-request” shows, extremely extensive song list, and wide range of song genres that has earned them the reputation of rarely being “stumped.” The band’s professional work ethic has also made them very well known for never taking breaks, and keeping their audience glued to the dance floor. “Soul Fish” is the perfect addition to your event, and are now available for wedding receptions, wedding ceremonies, corporate events, birthday parties, reunions, anniversaries, oyster roasts, festivals, or any occasion. 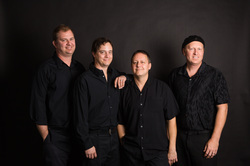 History: “Soul Fish”, based out of Charleston, South Carolina, has been together now for ten years with its original lineup, performing a variety of venues and private functions all along the east coast and is rapidly becoming the most popular variety band around. “Soul Fish” has also performed many special events including: “Happy New Year To Charleston at Marion Square- Charleston, South Carolina”, “The eighth annual Mom’s Run- Ruth Rhoden Craven Foundation for Postpartum Depression Awareness, “The Riverfront Park Grand Opening Celebration for the City of North Charleston Cultural Arts Department”, “Welcome Home for the 16th Airlift Squadron of the U.S. Air Force”, “Party at the Pointe for Charleston Harbor Hilton,” “The Blessing of the Fleet”, “The Arthur Ravenel Bridge Run”, “Q104.5 10th Anniversary Celebration”, North Carolina Health Care Facilities Association Annual Convention and Expo , and many more.